Our culture is devolving, taking on more and more narcissistic* characteristics. This is partly due to dis-proven self-esteem philosophies, and partly due to man's tendency to resist God's ways. ✤ 8 Christian characteristics with Scripture. It's good to periodically examine ourselves and let God's Word correct us (James 1:22-25; 2 Timothy 3:16-17). 1. The narcissist refuses criticism. ✤ The Christian listens and heeds constructive criticism - Proverbs 15:31. 2. The narcissist uses people. 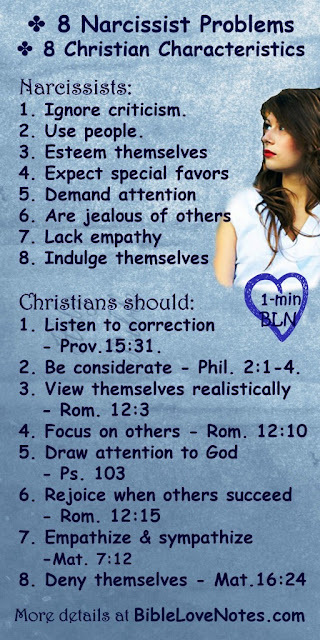 ✤ The Christian considers others better than himself - Philippians 2:1-4. 3. The narcissist exaggerates her importance, achievements and talents. ✤ The Christian has a realistic view of herself (Romans 12:3). 4. The narcissist expects special consideration. 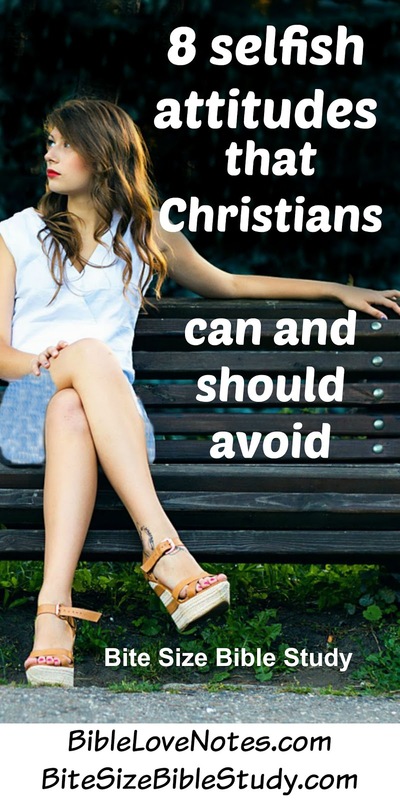 ✤ The Christian focuses on treating others considerately (Romans 12:10). 5. The narcissist requires constant attention. ✤ The Christian draws attention to God, not self (Psalm 103). 6. The narcissist is often jealous. ✤ The Christian rejoices when others succeed (Romans 12:15). 7. The narcissist disregards people's feelings, lacks empathy. ✤ The Christian treats others as he wants to be treated (Matthew 7:12). 8. The narcissist is obsessively selfish. ✤ The Christian denies himself (Matthew 16:24). Sign up below and validate the Feedburner email sent to you after subscribing. It's that simple! If you would like to receive a devotion and short Bible study (like the one below) each Monday, sign up for a Bite Size Bible Study subscription below. Or sign up for both, and get five 1-minute devotions each week and 1 Bite Size Study each Monday. 2 Timothy 3:1-5: But understand this, that in the last days there will come times of difficulty. 2 For people will be lovers of self, lovers of money, proud, arrogant, abusive, disobedient to their parents, ungrateful, unholy, 3 heartless, unappeasable, slanderous, without self-control, brutal, not loving good, 4 treacherous, reckless, swollen with conceit, lovers of pleasure rather than lovers of God, 5 having the appearance of godliness, but denying its power. Avoid such people. 2. We must sincerely, deliberately, proactively seek to recognize and overcome our narcissistic tendencies, especially when they are so prevalent and accepted in our culture. Proverbs 28:26: Those who trust their own insight are foolish, but anyone who walks in wisdom is safe. Great article. Thank you for the comparison to scripture. Makes it very clear to see Light & darkness without confusion by the enemy!